This is a guest post from Nicole Woulfe, a middle school social studies teacher from New Hampshire and a Citizen U pilot lesson implementer. Learn more about the creation, implementation and reflection of this lesson. What role did geography play in the turning points of Vicksburg and Sherman’s March during the Civil War? Geography Grade 6 Competency: Students will demonstrate and apply knowledge of geography and geographic tools in the study of the United States and the world around them. Work Study Practice: Recognize and produce work of high quality. Students will analyze maps from the Civil War. Students will read secondary sources about both events to find evidence to defend their claim. Students will synthesize information from various sources to create their own map. Students will produce work of high quality. Select the best sections of Under Siege to share with your class. Students should have an understanding of how to read with purpose. You may wish to have students read the non-fiction text independently, in pairs, or in small groups. You may wish to create a “cave like” setting in the classroom and allow students to read the text in small groups under their tables. Acquire the copies of the text needed or upload the text to Google Classroom to share with students electronically. Write the purpose for reading on the board in your classroom or on a slide to be projected for all students to see. Provide students with the reading and review the purpose for their reading: How did geography impact the Siege of Vicksburg? Students should read the text and mark evidence whilst they read. Depending on the length of text you choose, the reading can take an entire class period (e.g., 40 minutes) or more. Next, have groups report out on the evidence they pulled from the text to double check student success and see if they are still mastering the skill of text-marking. Review the Library of Congress Vicksburg Maps prior to introducing them. Generate a list of guiding questions for learners who will need scaffolding using the Map Analysis Guide. Upload the link to the map and, if necessary, the Map Analysis Guide to Google Classroom or a similar sharing platform. If you do not have access to technology, you may print the map(s). Direct students to analyze a map or series of maps from the Vicksburg maps. Using the evidence they collected in their secondary source reading, students will confirm or disagree with the statements made by the author using the map(s). The primary source analysis and evidence review will likely take an entire class period (e.g., 40 minutes). Upload the rubric for the formative assessment to Google Classroom or a similar sharing platform. If you do not have access to technology, you may print a copy of the rubric for each student. Gather supplies students will need including blank paper, rulers, extra erasers, colored pencils, fine tipped Sharpies, etc. 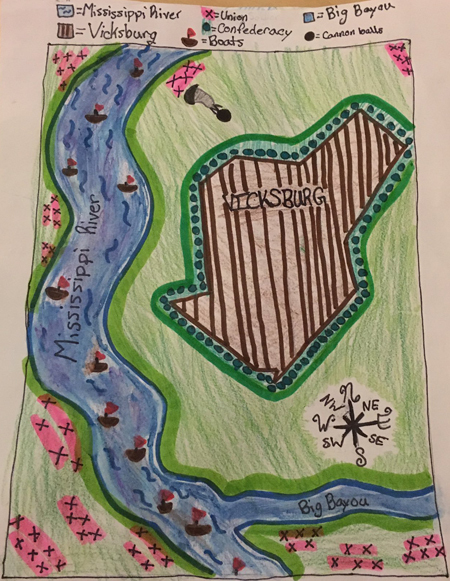 Using both the secondary source and the primary source map(s), students will construct their own map showing the impact of geography on Siege of Vicksburg (suggested time: 3 class periods). Grade all of the completed Formative Assessments. Teachers should provide feedback on all standards so students can improve upon them when they complete a similar task on Sherman’s March. Decide if you will have students showcase their work to the class using digital technologies or posting them around the room to complete a presentation gallery walk. To kick off the Formative Feedback Sharing Session, share a story about something that you, as the teacher, worked really hard on but didn’t turn out the way you wanted and you couldn’t figure out why. Maybe it was a lesson you taught, a paper you wrote, a recipe you prepared, an athletic endeavor, etc. Then explain who you discussed this disappointment with and what great advice they gave you to solve the problem. Invite students who met or exceeded the standards to showcase their work and explain how they completed the task. Next, invite students who did not meet the standard to showcase their work and get advice from their peers on ways to construct their map, explain their map, and/or create a quality product. After reviewing student work, direct students to generate their own checklist to allow them to meet the standards when they complete the task in the future (example). Follow the plan for the formative phase, using different materials as listed in the Lesson Activities section above. Depending on time, you may or may not wish to have a session where students present their maps to the class.